3ème 7 archivé - I like English! You should listen to the instructions. You should fasten your seatbelt or your harness. You should wait for your turn to enter the simulator. You shouldn’t scream / shout / speak too loud. [3rd person plural]: They should turn off their phones. - SHOULD : sert à faire une suggestion, à donner un conseil ou faire une forte recommandation. Ex : You should be polite. - SHOULDN’T: sert à déconseiller, à faire un reproche ou donner une quasi-interdiction. Ex : D. Trump shouldn’t be so intolerant and orange. - SHOULD dans une question: on demande un conseil. Ex : Should I call now ? This document is a podcast dealing with / talking about sending people to Mars. It will be developed during the next five years / within five years. Scientists want to send an American man and an American woman to the planet Mars in a spacecraft. The competition is addressed to university students who will elaborate plans for the year twenty eighteen (2018). At the end, their projects will be judged on quality , timing , cost and simplicity. Last week, you had a creative writing task to do about Hopper's painting and a story related to it. After that, we started a new 'sequence' based on space exploration. c) You can see this painting at the Art Institute of Chicago. On the photo we can see a man. stars in his hair represent/symbolize the US flag or a pop music band. In the bottom right-hand corner, we can read the letters “JPL”. We guess the letters stand for an advertisement company, the name of a music band or the initials of the man’s name. 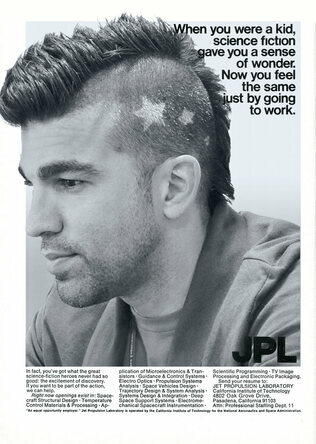 Actually, the stars in the man’s hair represent space because we can read the words “science fiction,” “wonder” in the slogan. This document is a job offer for NASA (the National Aeronautics and Space Administration) and JPL (Jet Propulsion Laboratory) in Pasadena, California. Today, we did the preparation of your creative writing task. Prendre des notes / les mettre en forme et reformuler de manière ordonnée. · Produire de manière autonome quelques phrases sur soi-même, les autres, des personnages réels ou imaginaires. · Écrire une histoire, un article, une publicité. Écrire à la manière de... Résumer. Rendre compte.